Curcumin, the bioactive component of turmeric, Curcuma longa has an exceptionally wide spectrum of activities including antioxidant, anti-inflammatory and anti-cancer properties, and is currently under different phases of clinical trials for various types of soft tissue cancers. However, although in vitro and animal studies have shown anticancer activities of curcumin for virtually all types of human cancers, its poor bioavailability in the human body has severely limited its application to these diseases. Methods to increase its oral bioavailability are a subject of intense current research. Reconstituting curcumin with the non-curcuminoid components of turmeric has been found to increase the bioavailability substantially. In the present clinical study to determine the bioavailability of curcuminoids, a patented formulation, BCM-95® CG was tested on human volunteer group. Normal curcumin was used in the control group. Curcumin content in blood was estimated at periodical intervals. After a washout period of two weeks the control group and drug group were crossed over BCM-95® CG and curcumin, respectively. It was also compared with a combination of curcumin-lecithin-piperine which was earlier shown to provide enhanced bioavailability. The results of the study indicate that the relative bioavailability of BCM-95® CG (Biocurcumax TM ) was about 6.93-fold compared to normal curcumin and about 6.3-fold compared to curcumin-lecithin-piperine formula. BCM-95® CG thus, has potential for widespread application for various chronic diseases. Curcumin, (diferuloylmethane; 1,7-bis[4-hydroxy-3- methoxyphenyl]-1,6-heptadiene-3,5-dione) along with its mono and di demethoxy derivatives, collectively called curcuminoids, constitute the major colouring matter and the biologically active constituents of Curcuma longa L. or turmeric. Ayurveda, Unani, Siddha and Chinese medicines recommend turmeric for a wide range of disorders and diseases. Modern science has provided a scientific basis for such uses [1-7]. Curcumin has been shown to be a very powerful antioxidant more potent than tocopherols, a comprehensive antiinflammatory, and an anti cancer compound beneficial in virtually all forms of human cancers, including cancers refractory to common anticancer drugs. Curcumin has been shown to enhance the effects of common anti-cancer drugs, and doses as high as 8 to 12 g per day have been shown to be well tolerated in humans [8,9]. While all anticancer drugs weaken the immune system, curcumin enhances it and acts as an immunorestorer [10-19]. Curcumin has been shown to be useful in a number of other chronic human ailments. For example, a human clinical trial is presently underway to test its efficacy in treating Alzheimer’s disease . Curcumin is able to modulate several molecular targets, including transcription factors, cell cycle proteins, cytokines and chemokines, a multitude of enzymes, receptors and cell surface adhesion molecules . In comparison with many diet-derived polyphenols and anti-cancer drugs, the bioavailability of curcumin has been poor [22-34]. For this reason, no clinical trial has progressed beyond the Phase I stage, and the wide range of physiological activities of curcumin has not yet been translated into clinical benefit. Poor absorption from the gut and avid metabolism in the body is cited as reasons for the lack of systemic availability. While the major portion of ingested curcumin is excreted through the feces unmetabolized, the small portion that is absorbed is extensively converted to its water-soluble metabolites, glucuronides and sulfate, and excreted. This seriously limits curcumin to reach targets distant from the gut and exert its beneficial action. There have been sporadic attempts to increase the bioavailability of curcumin. Piperine, an inhibitor of UDP-glucuronosyltransferase, administered along with curcumin has been found to significantly enhance the plasma curcumin concentration in animals and in humans . However, piperine is toxic in experimental animals [36-39]. Other formulations are currently under development [40-43]. While these developments are definitely encouraging, these require sophisticated technologies if and when they are fully developed. Such formulations are also unlikely to be costeffective. This study focused on a simple and costeffective formulation, trademarked BCM-95®CG (Biocurcumax™), taking advantage of the synergism between the sesquiterpenoids present in turmeric and the curcuminoids . Studies on experimental animals showed the efficacy of this formulation . This communication presents the results on the relative bioavailability of normal curcumin and that of BCM- 95®CG (Biocurcumax™) in human volunteers. The study also compares the relative bioavailability of BCM-95®CG (Biocurcumax™) with that of curcuminlecithin- piperine formula. BCM-95®CG (Biocurcumax™) 500 mg capsules were supplied by Arjuna Natural Extracts Ltd. Curcumin capsules (control) and curcumin-lecithin-piperine capsules were supplied by Life Extension, USA and the standard curcumin for quantitation was obtained from Sigma Chemical Co., USA. Chromatographic solvents and all other chemicals were purchased from Merck. This clinical trial was cleared by the Institutional Ethics Committee of the Little Flower Hospital, Angamali, Kerala, India on the request of the sponsor M/s Arjuna Natural Extracts Ltd, Kerala, India. Informed written consent from each of the prospective volunteers was obtained and after a medical examination those satisfying the inclusion and exclusion criteria, 11 subjects under the age group of 28-50 y were recruited for the study. The selected subjects were apparently healthy, and not diagnosed for any major diseases, as well as not presently taking any prescription medicines, and were not habitual users of tobacco and alcohol. The volunteers abstained from the consumption of aspirin or other NSAIDS and all foods containing turmeric two days prior to the study date. The volunteers were divided into three groups of 4, 4, and 3 and admitted to the hospital day before the trial. After overnight fasting, group1 volunteers (4 numbers) consumed 4×500 mg capsules of BCM- 95®CG (Biocurcumax™) while group 2 (4 numbers) and group 3 (3 numbers) consumed control curcumin and equivalent doses of curcumin-lecithin-piperine formula, respectively. Blood was drawn from each volunteer just prior to dosing and at 1, 2, 3, 4.5, 6 and 8 h post-drug. After wash out period of two weeks the subjects crossed-over to the other drug, i.e, group 1 subjects were administered control curcumin and the group 2 and 3 were consumed BCM-95®CG (Biocurcumax™) capsules. The same protocol was followed. The blood (5 ml) was centrifuged at 2000×g for 10 min and the plasma was carefully drawn and collected in weighed tubes and the weights of plasma was recorded and were frozen till analyzed. Each sample of plasma (2.5 g) was allowed to attain room temperature and extracted with 3+2+2 ml ethyl acetate successively and the pooled extracts were filtered into evaporation tubes and the solvent evaporated to dryness under a stream of nitrogen at 40-45o in a Turbo Vap Concentration Work Station (Caliper Life Sciences, USA). The dried samples were dissolved in 2 ml of methanol (HPLC grade) using a vortex mixer. It is then analyzed by HPLC in a Shimadzu LC 10AT Liquid Chromatograph System with SPD-10 A UV detector in isocratic mode. The column used was C18 ODS Phenomenex (250×4.6 mm, 5 μ particle size) with methanol as the mobile phase and the detection wave length 420 nm. Peaks were assigned in comparison with standard curcumin (Sigma). Curcumin was quantitated by using a calibration graph obtained from standard curcumin. There is an urgent need to find ways and means to enhance the bioabsorbability of curcumin so that its potential beneficial effects can be realized clinically. Results of the present study indicate that the proprietary formulation BCM-95®CG (Biocurcumax™) largely meets such a demand. The product at 2 g/ day levels was well tolerated by all the volunteers who had participated in the study without even mild adverse reactions. The method of estimation of curcumin from blood plasma was validated by doing the recovery (80%) analysis. The peaks obtained for the curcumin reference standard as well as curcumin from the blood plasma were matched and typical plasma sample profile is shown in fig. 1. The concentration time profile of control curcumin versus BCM-95®CG (Biocurcumax™) is shown in fig. 2 and that of curcumin-lecithin-piperine versus BCM-95®CG (Biocurcumax™) is shown in fig. 3. The values were analysed statistically by Anova and the difference shown by test and control groups were significant (P<0.05). As evident from fig. 2 the absorption of curcumin was faster from BCM- 95®CG (Biocurcumax™) peaking in the first hour (mean 315.8 ng/g). This value dropped a bit during the succeeding hour at 274.6 ng/g and then reached the maximum at 4.5 h (456.88 ng/g). Thereafter the values gradually decreased. However, even at 8 h some residual curcumin remained in the blood. In contrast, the absorption of control curcumin was relatively slower, peaking at 2 h (149.8 ng/g) and then virtually disappeared from the blood by 4.5 h. Considering that one hour is too short a time period for the ingested curcumin to reach the intestine and then into blood, it may be speculated that at least part of the curcumin from BCM-95®CG (Biocurcumax™) is absorbed extra-intestinally. Apparently, this does not happen with ordinary curcumin. Figure 1: HPLC profile of curcumin from blood plasma. Blood plasma was extracted with ethyl acetate successively; all the washings were pooled and dried. This was dissolved in methanol and 20µl of this solution was injected into the HPLC column. The retention time obtained was 3 min which is the same for standard curcumin. 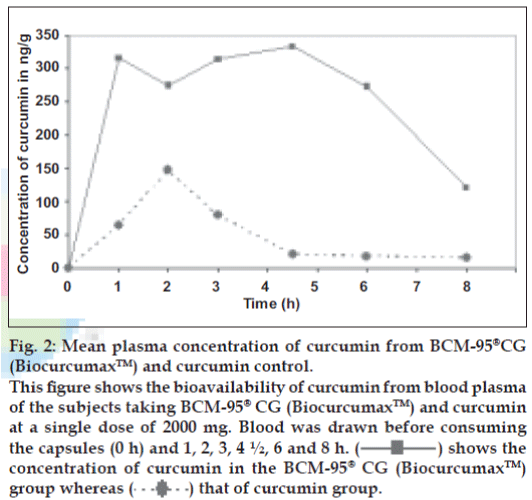 Figure 2: Mean plasma concentration of curcumin from BCM-95®CG (Biocurcumax™) and curcumin control. This figure shows the bioavailability of curcumin from blood plasma of the subjects taking BCM-95® CG (Biocurcumax™) and curcumin at a single dose of 2000 mg. Blood was drawn before consuming the capsules (0 h) and 1, 2, 3, 4 ½, 6 and 8 h. ( ) shows the concentration of curcumin in the BCM-95®CG (Biocurcumax™) group whereas ( ) that of curcumin group. Figure 3: Mean plasma concentration of curcumin from BCM-95®CG (Biocurcumax™) and curcumin-lecithin-piperine groups. This figure shows the bioavailability of curcumin from blood plasma of the subjects taken BCM-95® CG (Biocurcumax™) and curcuminlecithin- piperine complex at a single dose of 2000 mg. The blood was drawn before consuming the capsules (0 h) and 1, 2, 3, 4 ½,, 6 and 8 h ( ) shows the concentration of curcumin in the BCM 95® CG (Biocurcumax™) group where as ( ) that of curcumin + lecithin + piperine complex group. BCM-95®CG (Biocurcumax™) may also probably modulate the Phase II enzymes due to its longer presence in the tissues and blood. Curcumin is simultaneously a substrate for these enzymes, an inducer of this enzymes as well as an inhibitor of these enzymes, depending on the context. However, which pathway is operating in individual cases is difficult to predict. Further, owing to its longer presence, curcumin from BCM-95®CG (Biocurcumax™) may modulate also the activity of the efflux pump, P-glycoprotein. All these activities may help to improve the absorption of curcumin from the present formulation compared to normal curcumin. The pharmacokinetic data were arrived at using WinNonlin software (Table 1). BCM-95®CG (Biocurcumax™) showed a mean t 1/2 (half-life) of 4.96 h, Ke (elimination rate constant) of 0.26 h-1 while the corresponding values for curcumin were 2.6 h and 0.296 h-1, respectively. The area under the curve (AUC) of BCM-95®CG (Biocurcumax™) was about 6.93 times that of curcumin control meaning a bioavailability enhancement of 693% (Biocurcumax™ (AUC)-3201.28, Curcumin (AUC)-461.86). The bioavailability of BCM-95®CG (Biocurcumax™) versus curcumin-lecithin-piperine formula, as seen in fig. 3, also shows an enhancement of 6.37. BCM- 95®CG (Biocurcumax™) had better bioavailability than curcumin-lecithin-piperine formula, and well as a longer retention time compared to the latter. The mean plasma concentration of curcumin from curcumin-lecithin-piperine formula reached a peak value of 344.32 ng/g and a Tmax of 3.5 h while the corresponding values for curcumin from BCM- 95®CG (Biocurcumax™) were 689.18 ng/g and 4.67 h, respectively (Table 2). The elimination rate constant (Ke) for curcumin-lecithin-piperine formula was 0.3372 h-1 compared to 0.139 h-1 of BCM- 95®CG (Biocurcumax™), thus clearly establishing the difference between BCM-95®CG (Biocurcumax™) and curcumin-lecithin-piperine formula. The area under the curve (AUC) 0 to infinity for curcumin-lecithinpiperine formula was 624.26 units while that of BCM- 95®CG (Biocurcumax™) was 3975 units. Thus, BCM-95®CG (Biocurcumax™) has a relative bioavailability of 6.37 compared to that of curcumin-lecithin-piperine formula. BCM-95®CG (Biocurcumax™) should also have a better safety profile because the composition is made entirely from turmeric in sharp contrast to the formulation containing piperine which is toxic to experimental animals [36-39]. In our hands, this composition improved the bioavailability of curcumin only marginally. Results of the present pilot study indicate that curcumin is absorbed early and retained longer from the BCM-95®CG (Biocurcumax™) composition compared to normal curcumin as well as from curcumin-lecithin-piperine combination. The results also indicate a probable role for the non-curcuminoid components of turmeric (especially Ar-turmerone) in the absorbability of curcumin in vivo. The authors deeply acknowledge Dr. T. N. B. Kaimal for his valuable suggestions and late Dr. S. B. Rao for his technical guidance when he was with them. Maheshwari RK, Sing AK, Gaddipati J, Srimal RC. Multiple biological effects of curcumin: A short review. Life Sci 2006;78:2081-7. Bengmark S. Curcumin, a toxic antioxidant and natural NFkappaB, cyclooxygenase-2, lipooxygenase, and inducible nitric oxide synthase inhibitor: A shield against acute and chronic diseases. J Parenter Enter Nutr 2006;30:45-51. Aggarwal BB, Shishodia S. Molecular targets of dietary agents for prevention and therapy of cancer. Biochem Pharmacol 2006;71:1397- 421. Sharma RA, Gescher AJ, Steward WP. Curcumin: The story so far. Eur J Cancer 2005;41:1955-68. Duvoix A, Blasius R, Delhelle S, Schnekenburger M, Morceau F, Henry E, et al. Chemopreventive and therapeutic effects of curcumin. Cancer Lett 2005;223:181-90. Joe B, Vijayakumar M, Lokesh BR. Biological properties of curcumincellular and molecular mechanisms of action. Crit Rev Food Sci Nutr 2004;44:97-111. Arajuo CC, Leon LL. Biological activities of Curcuma longa L. Mem InstOswaldo Cruz 2001;96:723-8. Lao CD, Ruffin MT 4th, Normolle D, Health DD, Murray SI, Baily JM, et al. Dose escalation of a curcuminoid formulation. BMC Complement. Altern Med 2006;6:10-13. Cheng AL, Hsu CH, Lin JK, Hsu MM, Ho YF, Shen TS, et al. Phase I clinical trial of curcumin, a chemopreventive agent, in patients with high-risk or pre-malignant lesions. Anticancer Res 2001;21:2895-900. Jagetia GC, Aggarwal BB, .Spicing up. the immune system by curcumin. J Clin Immunol 2007;27:19-35. Bhattacharyya S, Mandal D, Sen GS, Pal S, Banerjee S, Lahiry L, et al. Tumor-induced oxidative stress perturbs nuclear factor-kappaB activity-augmenting tumor necrosis factor-alpha-mediated T-cell death: Protection by curcumin. Cancer Res 2007;67:362-70. Churchill M, Chadburn A, Bilinski RT, Bertagnolli MM. Inhibition of intestinal tumors by curcumin is associated with changes in the intestinal immune cell profile. J Surg Res 2000;89:169-75. Pal S, Bhattacharyya S, Choudhuri T. Amelioration of immune cell number depletion and potentiation of depressed detoxification system of tumor-bearing mice by curcumin. Cancer Detect Prev 2005;29:470-8. Perkins S, Verschoyle RD, Hill K, Parveen I, Threadgill MD, Sharma RA, et al. Chemo preventive efficacy and pharmacokinetics of curcumin in the min/+ mouse, a model of familial adenomatous polyposis. Cancer Epidemiol Biomarkers Prev 2002;11:535-40. South EH, Exon JH, Hendrix K. Dietary curcumin enhances antibody response in rats. ImmunopharmacolImmunotoxicol 1997;19:105-19. Kurup VP, Barrios CS, Raju R, Jhonson BD, Levy MB, Fink JN. Immune response modulation by curcumin in a latex allergy model. Clin Mol Allergy 2007;5:1-12. Xu Y, Ku B, Tie L. Curcumin reverses the effects of chronic stress on behavior, the HPA axis, BDNF expression and phosphorylation of CREB. Brain Res 2006;1122:56-64. Kim GY, Kim KH, Lee SH, Yoon MS, Lee HJ, Moon DO, et al. Curcumin inhibits immunostimulatory function of dendritic cells: MAPKs and translocation of NF-kappa B as potential targets. J Immunol 2005;174:8116-24. Bhattacharyya S, Mandal D, Saha B. Curcumin prevents tumor-induced apoptosis through Stat-5a-mediated Bcl-2 induction. J Biol Chem 2007;282:15954-64. Ringman JM, Frautschy SA, Cole GM, Masterman DL, Cummings JL. A potential role of the curry spice curcumin in Alzheimer.s disease. Curr Alzheimer Res 2005;2:131-6. Shishodia S, Sethi G, Aggarwal BB. Curcumin: Getting back to the roots. NY Acad Sci 2005;1056:206-17. Wahlstrom B, Blennow G. A study on the fate of curcumin in the rat. Acta Pharmacol Toxicol (Copenh) 1978;43:86-92. Ravindranath V, Chandrasekhara N. In vitro studies on the intestinal absorption of curcumin in rats. Toxicology 1981;20:251-7. Holder GM, Plummer JL, Ryan AJ. The metabolism and excretion of curcumin (1,7-bis-(4-hydroxy-3-methoxyphenyl)-1,6-heptadiene-3,5- dione) in the rat. Xenobiotica 1978;8:761-8. Ravindranath V, Chandrasekhara N. Metabolism of curcumin--studies with [3H] curcumin. Toxicology 1982;22:337-44. Ravindranath V, Chandrasekhara N. Absorption and tissue distribution of curcumin in rats. Toxicology 1980;16:259-65. Asai A, Miyazawa T. Occurrence of orally administered curcuminoid as glucuronide and glucuronide/sulfate conjugates in rat plasma. Life Sci 2000;67:2785-93. Pan MH, Huang TM, Lin JK. Biotransformation of curcumin through reduction and glucuronidation in mice. Drug Metab Disp 1999;27:486- 94. Ireson C, Orr S, Jones DJ, Verschoyle R, Lim CK, Luo JL, et al. Characterization of metabolites of the chemopreventive agent curcumin in human and rat hepatocytes and in the rat In Vivo, and evaluation of their ability to inhibit phorbol ester-induced prostaglandin E2 production. Cancer Res 2001;61:1058-64. Ireson CR, Jones DJ, Orr S, Coughtrie MW, Boocock DJ, Williams ML, et al. Metabolism of the cancer preventive agent curcumin in human and rat intestine. Cancer Epidemiol Biomarkers Prev 2002;11:105-11. Hoehle SI, Pfeiffer E, Solyom AM, Metzler M. Metabolism of curcuminoids in tissue slices and subcellular fractions from rat liver. J Agr Food Chem 2006;54:756-64. Sharma RA, McLelland HR, Hill KA, Ireson CR, Euden SA, Manson MM, et al. Pharmacodynamic and pharmacokinetic study of oral Curcuma extract in patients with colorectal cancer. Clin Cancer Res 2001;7:1894-900. Garcea G, Berry DP, Jones DJ. Consumption of the putative chemopreventive agent curcumin by cancer patients: Assessment of curcumin levels in the colorectum and their pharmacodynamic consequences. Cancer Epidemiol Biomarkers Prev 2005;14:120-5. Sharma RA, Euden SA, Platton SL, Cooke DN, Shafayat A, Hewitt HR, et al. Phase I clinical trial of oral curcumin: Biomarkers of systemic activity and compliance. Clin Cancer Res 2004;10:6847-54. Shoba G, Joy D, Joseph T, Majeed M, Rajendran R, Srinivas PS. Influence of piperine on the pharmacokinetics of curcumin in animals and human volunteers. Planta Med 1998;64:353-6. Piyachaturawat P, Glinsukon T, Toskulkao C. Acute and subacute toxicity of piperine in mice, rats and hamsters. Toxicol Lett 1983;16:351-9. Daware MB, Mujumdar AM, Ghaskadbi S. Reproductive Toxicity of Piperine in Swiss Albino Mice. Planta Med 2000;66:231-6. Panda S, Kar A. Piperine Lowers the Serum Concentrations of Thyroid Hormones, Glucose and Hepatic 5′D Activity in Adult Male Mice. Horm Metab Res 2003;35:523-6. Unchern S, Saito H, Nishiyama N. Death of Cerebellar Granule Neurons Induced by Piperine Is Distinct from that Induced by Low Potassium. Neurochem Res 1998;23:97-102. Marczylo TH, Verschoyle RD, Cooke DN. Comparison of systemic availability of curcumin with that of curcumin formulated with phosphatidylcholine. Cancer Chemother Pharmacol 2007;60:171-7. Li L, Bratiteh FS, Kurzrock R. Liposome-encapsulated curcumin: In vitro and In Vivo effects on proliferation, apoptosis, signaling, and angiogenesis. Cancer 2005;104:1322-31. Kumar V, Lewis SA, Mutalik S, Shenoy DB, Venkatesh, Udupa N. Biodegradable microspheres of curcumin for treatment of inflammation. Indian J Physiol Pharmacol 2002;46:209-17. 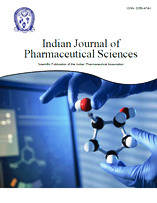 Bisht S, Feldmann G, Soni S, Ravi R, Karikar C, Maitra A. Polymeric nanoparticle-encapsulated curcumin (nanocurcumin): A novel strategy for human cancer therapy. J Nanobiotechnol 2007;5:3-21. Antony B, A composition to enhance the bioavailability of curcumin, WO2006129323, Arjuna Natural Extracts Ltd; 2006. Merina B, Antony B. Bioavailability of BiocurcumaxTM (BCM-95TM). Spice India 2006;19:11-15.